(Nanowerk News) For decades, microbiologists thought that bacteria act individually, unaware of their multitudinous counterparts involved in causing the same infection. 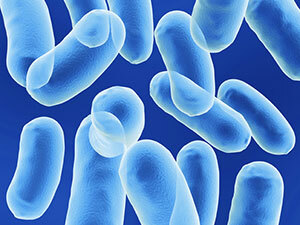 In the past two decades, however, they have discovered that many species of bacteria ‘communicate’. In fact, bacteria can signal to each other that their numbers are sufficient to launch a coordinated attack. Many types of bacteria cells can communicate using quorum sensing. Owing to the relative newness of this research area, few of these cell-to-cell signaling systems, known as quorum sensing, have been described. Now, by working with Burkholderia cenocepacia, an opportunistic pathogen that infects cystic fibrosis patients, a research team led by Lian-Hui Zhang from the A*STAR Institute of Molecular and Cell Biology (IMCB) has described a previously unknown quorum-sensing system that is present in many human bacterial pathogens ("Cis-2-dodecenoic acid receptor RpfR links quorum-sensing signal perception with regulation of virulence through cyclic dimeric guanosine monophosphate turnover"). Many types of individual bacterial cells send and receive ‘messages’ via chemical signals called quorum-sensing (QS) molecules. When concentrations of QS molecules reach a threshold, individual bacterial cells simultaneously activate their virulence genes. By identifying the signaling molecules and decoding these communications, researchers may also be able to reduce bacterial virulence by interrupting these conversations. Such treatments could provide an alternative to antibiotics. For the QS molecule of B. cenocepacia, BDSF, Zhang and his co-workers identified a novel receptor, RpfR. The researchers produced mutant bacteria that lacked either the receptor RpfR, or the capacity to produce the signal BDSF. Both types of mutant bacteria showed decreased motility, produced fewer host-degrading enzymes, and were less able to form biofilms — bacterial aggregates encased in slime — indicating that BDSF and RpfR act together to send and receive the virulence signal. Zhang and his co-workers also showed that, unlike other QS receptors, RpfR is a multitasking molecule. In other systems, after the receptor binds the QS molecule, it recruits another molecule to perform the next step in the signaling cascade and trigger gene expression. In the quorum-sensing system of B. cenocepacia, however, RpfR binds BDSF, then changes shape and performs the next step itself. Combining the two functions in a single molecule expedites the signaling process, and enables bacteria to adapt very quickly to changing environmental conditions. The team’s search of known bacterial genomes showed that the system is present in many other pathogenic bacteria, including several groups that produce opportunistic infections in immune-compromised patients. “We would like to design chemical compounds to block the BDSF receptor, to compete with BDSF signals and reduce the virulence and pathogenicity of B. cenocepacia,” says IMCB team member Yinyue Deng.